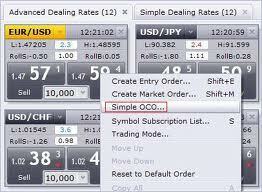 Another type of order used in the forex markets are OCO orders, also known as Order Cancels the Other orders. This order type is not found on the MetaTrader4 platform, but rather on other proprietary trading platforms and on ECN trading platforms. An Order Cancels the Other order combines two orders: a stop and a limit order. It simply mandates the broker to close one order when the other order is fulfilled, just as the name implies. The OCO is usually used when the direction of the currency asset cannot be determined with accuracy, or if the trader is not sure of what direction the asset will assume. It is a pending order, and so the trader can set it and leave, allowing the automated instruction to the broker to do the rest. When a trader is using the OCO order for closing trade positions automatically, the OCO is used as a stop loss and a take profit order, with the stop loss being set as a stop price and the take profit point being set as a limit price. Assuming a trader is in an active position on the EUR/USD on which he had gone long at 1.2330, and he expects the currency pair to hit 1.2430 in five days of trading. In order to cut his risk he is prepared to take a maximum loss of 50 pips at 1.2280, but forgot to set the stop loss on trade entry. This trader can decide to use an OCO order to set his profit and loss targets, by setting a stop order (in this case, a stop loss) to close the position at 1.2280, and simultaneously set a limit order (take profit level) to close the position at 1.2430, depending on which comes first. This trade setup using the OCO order will set his stop loss and profit targets as an exit trade strategy. When a trader is using the OCO as a trade entry order, one of the orders is used as a stop entry order and the other as a limit entry order. In this case, the stop entry order is set to trigger the trades if the price of the asset experiences a downside move, and the limit entry will be used to catch an upside move. Once any of these orders are triggered, the other is cancelled automatically. This application of the OCO order finds great use in spike trading of the news so that the trader can catch the spike early in whatever direction it assumes. To illustrate this, let’s say the trader wants to trade the GBP/USD at a quoted price of 1.2760/1.2764, but is unsure of where the trade is going and he will probably not be around his computer to take the trade at a satisfactory point. He decides to use an OCO order and sets the limit order to trigger only when the currency asset has reached 1.2800. He also decides to set a stop entry order to trigger if the currency asset drops to 1.2700. Once anyone of the orders is triggered, the other is cancelled. Stop entry and limit entry orders can either be of the Buy or Sell variety, and a trader can use anyone he feels will suit the trade based on his analysis. In both scenarios, the OCO orders can be set as Good-till-Day orders (to be removed at the end of the trading day if not triggered) or as Good-till-Canceled (GTC) orders which stay active until the trader manually cancels them. One of the best applications of an OCO order is when trading the news and trying to catch the spike. Some traders set two trade entries above and below the market price, expecting that the spike will catch one and they can manually close the second one. There is a problem with this approach as the unpredictable nature of the news trade can cause the trade to hit one order and then reverse instantly and hit the other. In unfortunate situations, the trade can end up in a double loss. Once you have the OCO in place, this does not happen and the trader’s risk is mitigated.